Deep Elm Records is responsible for some of the most consistently excellent new music coming through our speakers these days and the Maui-based label has delivered again with the release of a new video for the song "All the Streets of My Hometown" by Aldershot, England's Our Lost Infantry. The band's name evokes thoughts of Wilfred Owen and Siegfried Sassoon, and a turn through the video makes the idea of these dead men being influences seem not farfetched. It was filmed in Norway's Blefell Mountains, and the austere setting and color, coupled with the recurrent image of a tin hat and gas mask, give it a WWI patina. It's a compelling video even with the mute button on. But don't watch it that way, because there are some terrific things happening in this song you need to hear. The first two minutes build tension with chiming guitars and slow vocals, reminiscent of some of the Scottish bands on the Fat Cat label, but at about 2.30, instead of the crashing wall of sound you might expect, the band shift to a really nice prog-riff, like something Robert Fripp might have done on "Larks Tongues in Aspic, Pt. 23". Oh yeah, and then the wall of sound with the beautiful chorus, followed by a bigger wall of sound pounding out the last 30 seconds. Exhilarating. If you'd like to hear more, you'll have to wait -- but not long. Our Lost Infantry's debut album, The New Art History, will be released by Deep Elm in the US on 14 November. Start saving now. Our Lost Infantry band page. The Soul Corner - Gladys Knight "If I Was Your Woman"
I've written here on the Soul Corner about Gladys Knight before. Her voice, real as a heart attack, is one of my favorites in the Motown pantheon. And let's praise the Pips. Honored and teased a bit in the Doonesbury comic strip, their silky smooth dance moves are legendary. But did you know they were family? The Pips were Gladys' older brother Merald "Bubba" Knight, who also served as her business manager, and their cousins Edward Patten and William Guest. Chuckle if you want, but those are some great backup vocals. Taut, dark, sludgy, and lo-fi, with aggressive bass and a dose of distortion, the Spirals EP from Edinburgh's Epsilon One says "pay attention to me" from the opening notes of the title track. At times it seems late-night industrial indie rock, and at times a grimy nugget of electro-rock. This is one of those new and almost unknown artists that is worth getting to know before every social music site proclaims that Epsilon One is their new discovery. The guitar, synths, bass, drums, programming and vocals are all the work of Dicky Lorin. The Spirals EP is out on Dog Got A Bone Records, and we understand that Dicky is planning a full length release in 2013. Stream all for tracks here. Source it at the Bandcamp or the links below for Dog Got A Bone Records. The Americana soul and doo-wop folk of Sam Russell and his collaborators, The Harborrats, have featured on this pages several times, but this appearance represents a little change of pace. In The Year of the Cow, Sam has pared down the contributing musicians and recorded an album of folk music. In essence, this is the first solo album in Sam's Blue Moon Bible project, in which he intends to record eight albums consisting of eight songs each with recurring characters. The Year of The Cow is the sixth in the series, by my count (although, as a former history major, I disclaim any responsibility for counting accurately). This approach emphasizes Sam's warm, comfortably worn vocal delivery and the sincerity of the compositions. And both the delivery and the quality of the songs are capable of the burden of carrying the album. As the rainy season reaches the Pacific Northwest, and I look for musical accompaniment for my late night reflection, my choice these days is The Year of the Cow. The overall effect is that Sam is singing his stories just for you. And that is a very good way to spend some time. If you would like to evaluate the entire album, you can stream it in its entirety at the Bandcamp site linked below. The Year of the Cow was recorded, engineered, mixed and mastered in Seattle. All songs are written by Sam except for the closing track, "Whatever's Left", which was composed by Zoe Muth. 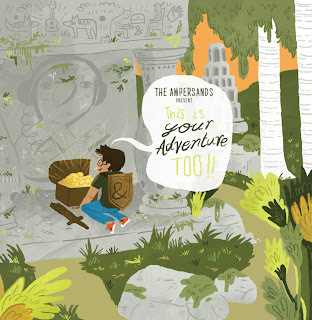 The credits are Sam Russell (vocals and guitar), Ken Nottingham (upright bass and harmonica), Michael Spaly (fiddle, mandolin, banjo and percussion), and Daniel Walker (piano on "Whatever's Left"). San Francisco's psych/surf rockers The Mallard are on the move again. Apparently rested after their summer west coast and Midwest swing, they are gracing the east in November. It appears that they'll be done in time for The Mallard to eat turkey at home. We made our feelings about the band's debut album, Yes On Blood, know earlier this year (review). But in case you need a refresher, here is one of my favorite tracks from that album. The Mallard also participated in a Velvet Underground tribute album curated by their label, Castle Face Records. The limited run vinyl album was sold out at the pre-order stage, but individual songs are available for download. The Mallard's contribution this smashing version of VU's "There She Goes Again". Ahem ... note the download button. I've seen these guys live, and it is worth your effort. The Ampersands are a New York-based rock band playing power pop - really good power pop, smart and catchy a la Fountains of Wayne. On This Is Your Adventure Too, you will hear echoes of all kinds of indie rock you have enjoyed, and there's plenty of creativity and smarts on this record... name me the last rock record you heard with two 5-syllable words in the lead track? Opening track "Exoskeleton" (one of the big words - the other is "photosynthesize", because, hey, why not challenge your listeners to think if you're talented enough to write this stuff?) is a very good example of the quiet/loud indie aesthetic, and of the creativity in their approach. This is a song about a guy who's decided that the way to keep himself from getting hurt is to construct a protective outer shell (and no spine!) The first verse is intoned quietly, nearly whispered, until the guitars ramp up and it's off to the races. The second track, "Try This", is a very good song - bouncy, catchy - a real delight, with lyrics that intersperse encouragement and mythological imagery, another example of these guys' pretty unique approach. And they're happy for you to have a copy of this song for your very own - click here to download. And you can listen, read their thoughts, stream and buy the whole thing at their website. It's as good an album website as I've seen - like I said, these guys are smart, creative and imaginative. If you like your music catchy, but with a brain, this will be something for you to enjoy. On the website, it's set up as Side One and Two, and there does seem to be a split - Side Two's songs are mostly ballads, except for the last song. It's a short instrumental that doesn't really sound much like the rest of the record. Not surprisingly to me, these cats named it "Outlier". Like I said, smart. Lead men Aaron McQuade and Jim Pace have the voices to carry the ballads, too - and you know that isn't always the case with power pop bands. All told, this is a very entertaining record - a welcome development and one of my favorites of the year so far. Marrying the harder-edged punk side of power pop with the better produced end of garage pop, and garnished with a dose of punk attitude and surf-rock riffs, San Diego's Plateaus have recorded one my favorite garage pop albums of the year. The songs are brief, hook-filled, energetic and noisy. The drums pound, the heavy bass fuzzes and the dominating guitars bring the distortion and reverb. 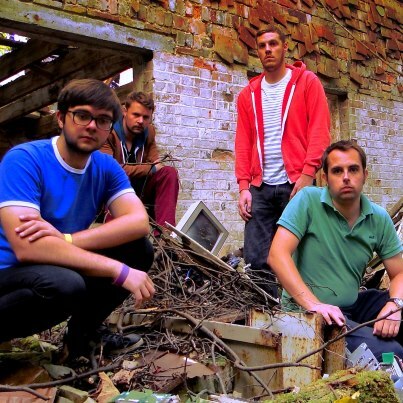 Try them out with one of the album tracks that previously was released as a single. Plateaus are Kevin Gist Chris Rosi, Jon Greene and Elliot Moeller. They have been building buzz on the west coast via their energetic shows and some well received 7" for Art Fag Records, which also is the label for this record. This fall they toured with Colleen Green, and the hard-working guys both played their own set and served as Colleen's back up band. 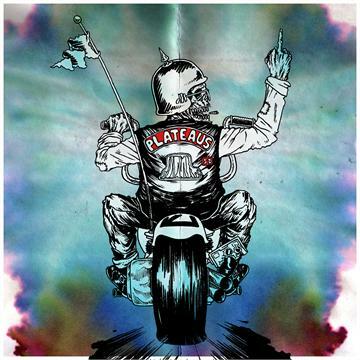 Plateaus "Do It For You" (OFFICIAL MUSIC VIDEO) from Dusty Dirtweed on Vimeo. So, if you want to beef up your fall playlist with some muscle with hooks, this record is fully loaded with what you're looking for.